A New York street is drawn in immaculate perspective - like an architect's rendition. In the street are two cars, drawn with the same anonymous elegance but, while the skyscrapers are evoked only with line, these cars are conceived in terms of tone and mass; the chrome work becomes a brilliant pattern of highlights and reflections. In the foreground is the head and shoulders of a woman - rather grotesque with piled hair, the skin on her neck folding into deep creases. 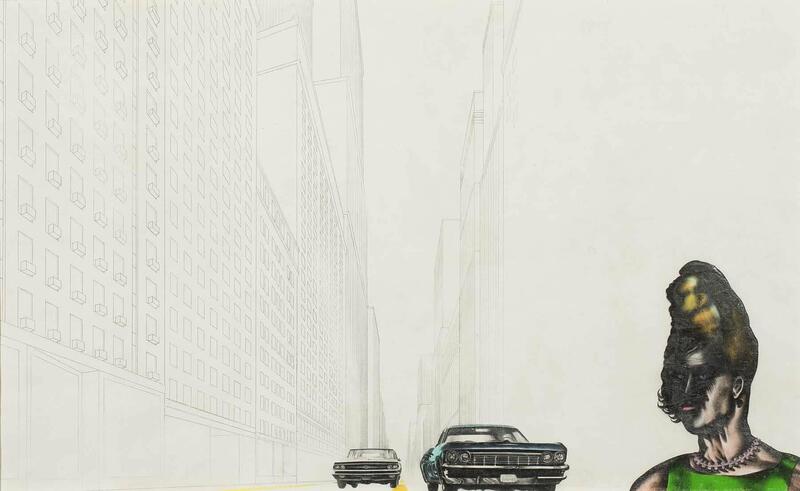 Since the vanishing point of the perspective corresponds in elevation with the fenders of the cars, she seems to be situated below the road level, yet otherwise her position in the picture suggests that she is crossing the roadway. Such an impression might be achieved with a telephoto lens, if we assume the gradient to be descending towards her, but no explanation is given by the artist so the effect is simply disturbing (the more so for being undetectable on casual inspection). Also the picture is curiously empty. Do these hundreds of windows overlook just the two cars and a single pedestrian? The composition can be read as straightforwardly as a newspaper photograph, but the selection of the details translates it into a sinisterly beautiful subjective image. This image is complete in itself - no stylistic fragmentation is employed - yet it implies a fragmentation of reality; it can be read as a snapshot of a continuum, but no law of cause and effect is evident. It exists as a fragment of reality detached from any necessity of past and future... With Self's drawings, another literary parallel suggests itself; that of a science fiction writer who generally finds himself describing a non-Aristotelian situation from an Aristotelian pint of view ... the drawing was begun in New York while the artist was tuned into the atmosphere of the city, it sinister elegance charged with the way people adjust to the new environments and situations and with how the new culture incorporates crisis into its behaviour patterns. Cars (and other manufactured products) of a nation reveal many of the characteristics of that nation. Because people have adjusted to pessimistic events, leisure seems to have forced the upper hand at the moment. Reflected to me in "classic lines" and bright new colours of many new cars, etc. Most people appear to have forced fear of warfare from their everyday existence by developing a greed for these comforts. Again, this is happening in a more extreme way in the U.S. and can be seen more easily there. It can be seen from the above that Self is deeply concerned with the paradoxes of terror and pleasure.